STOPLINE-S anti-ram arm barrier is designed to stop light-duty freight vehicles. Four steel cables running through the boom to the fixings in concrete foundations create an obstacle with tear force over 60 tons. This allows stopping a light-duty truck with gross vehicle weight of 3.5 tons at a speed of 50 km/h. For cities and residential areas with high aesthetic requirements to equipment installed in public places we have developed an anti-ram barrier with a neat aluminum boom, unremarkable at a glance and looking like a standard arm barrier that can be found anywhere. In city centers, private residential areas and places where the entry of heavy-duty trucks is prohibited or the winding alleys prevent heavy transport from speeding, STOPLINE-S barrier installation allows a secure protection of the restricted area. Stage One: making concrete pads for supports, incorporating special fixings to connect the cables. Stage Two: installing barrier supports using anchor bolts over the concrete pads and connecting them to the fixings. The sequence allows preparing installation ground in advance, during civil works. Final installation of the anti-ram barrier is performed by surface mount, which does not require major construction machinery and can be done quickly, with an opportunity to correct inaccuracies of the initial concreting. If the upper segment of the barrier gets damaged, it can be replaced without foundation work. STOPLINE-S anti-ram arm barrier comes either with electromechanical, hydraulic or manual drive, depending on operating requirements. Electromechanical drive is the best choice for areas with low traffic intensity (60-100 openings an hour). Hydraulic drive supports intensive operation with unlimited number of openings/closings and short cycle time. This type of drive is well suited for places where anti-ram barrier also serves the purpose of traffic regulation. 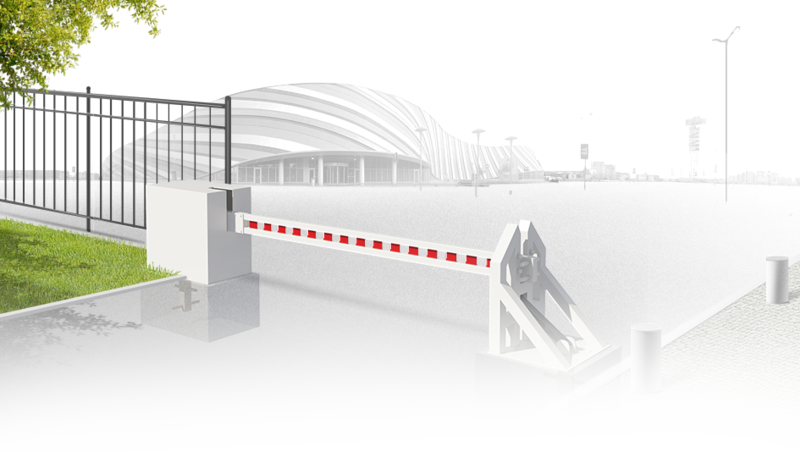 The barrier installed at airports, railway stations, car parks or garages enables efficient control and passage of intense vehicle traffic. As a double anti-ram barrier, a manually driven arm barrier is used at service entries with small number of passing vehicles, or in places with a gateway entry system and mandatory inspection. The passageway width between supports is 3 to 6 meters, which allows blocking both single- and double-lane roads. Electrical arm barrier controls allow external control connection. This can be either a remote control by an operator at the control panel, or a signal from an entry system (a magnetic card, a key, a radio signal, and the like).